They are now being made into Hollywood films in the same order. The first one came out in 2005. The “Dawn Treader” is in theatres now (2010). Narnia is a world of talking animals, witches, castles, dwarves, dragons and so on. In the early 1900s there were secret passageways between England and Narnia that opened and closed, allowing children to visit Narnia. In the first book the secret passageway is at the back of a wardrobe. Lucy Pevensie discovers it during a game of hide and seek. She and her two brothers and one sister go to see Narnia. When they get there they find that it has been winter for a hundred years. It is always winter but Father Christmas never comes – because Narnia is under the magic spell of the White Witch. With the help of a wise, talking lion named Aslan, they defeat her and become kings and queens. Aslan is more than just a nice old talking lion: he created Narnia. He is to Narnia what Jesus Christ is to our world: God made flesh. He even saves Narnia by allowing the White Witch to kill him! 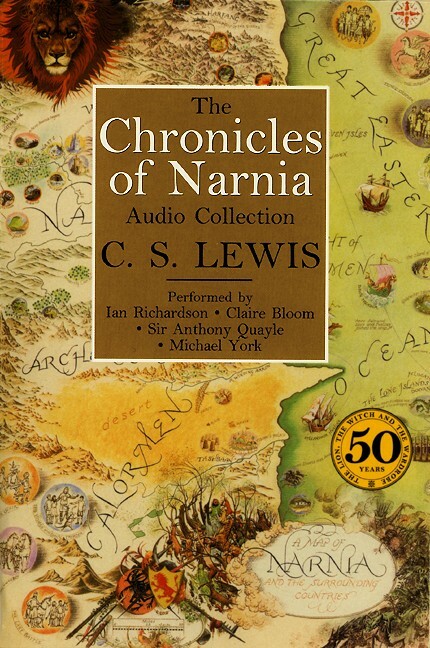 Lewis said that the Chronicles were, in effect, the Bible rewritten for children, written in a way that would appeal to English children in the 1950s and speak to their understanding. Lewis was a professor whose big thing was the use of allegory in the Renaissance and the Middle Ages. But he also wrote books for the general public about the Christian faith. He did that in different ways for different audiences. For children he did it through the Chronicles, mostly through allegory. Christian ministers in his day talked over the heads of most people. The Chronicles were first read at the Inklings, a writing club at Oxford that both Lewis and Tolkien belonged to. Each week they would meet and read from what they had been writing. So it is where “Lord of the Rings” was first heard too. The two stories are alike in some ways (dwarves, dragons, good against evil, etc), but the Chronicles is aimed more squarely at children and is not as rich of a story. Reading to children: In my own experience, Narnia is one of the few books, along with Winnie the Pooh, Alice in Wonderland, Pinocchio, Greek myths and Grimm’s tales, that you can read to children ages 6 to 11 and still enjoy yourself. It helps you to understand this world – even though it is about another world. The boy who appears in “The Magician’s Nephew” later appears as a professor in “The Lion, the Witch and the Wardrobe”. It is almost certainly C.S. Lewis himself. Other children’s reads with an adult literary appeal: Carl Sandburg’s “Rootabaga Stories”; Kipling’s “Just So Stories.” Of the latter, in the 1980’s there were a series of commercial recordings (Wyndham Hill if memory serves) with Jack Nicholson reading the text and Bobby McFerrin singing interpretive music. “The Elephant’s Child” became a smash hit (my favorite line: “But it never grew any shorter”). I still have it somewhere on cassette. An interesting point about the Chronicles of Narnia is that the same type of allegory — creating a set of fables that substitute a wild animal for the prophet Muhammad — would be considered blasphemous in Islam and would likely subject the author and publisher to a death sentence. I’ve heard that Tolkein was not a particularly religious man initially, but that Lewis converted him. I never saw Aslan as a Jesus carachter nor I do now, no matter what Lewis said. He could be Adonis, Atiis, Osiris or any other such type. For me the point was the world full of fantastic creatures who were alive. Also, very interestingly, I saw Narnia as a multicultural world. I my kids mind, there were all races and creatures. The movies, in my mind, are little bit too white washed for me. I enjoyed many of the Narnia books when I was a child even though I recognized that they weren’t written at anywhere close to the level of LOTR. Tolkien detested allegory. He said so many times and for this and other reasons was not really a fan of the heavily allegorical Narnia series. He told Lewis this and it strained their friendship somewhat. Aslan was Christ. Lewis was pretty clear on that. It was Tolkien who converted the atheist Lewis to Christianity. Yeah I know that Lewis said that Aslan was christ but for me, particulary as a kid, he was not. And now, as a grown up, I still see Aslan in the cathergory of the sacrificial gods who will rise from the dead, like Christ, Osiris, Adonis, Attis, Bacchus, Mithra etc. They all did that, you know. The same story just told differently. That being said, I did watch the first Narnia movie, and while I am not sure whether it was true to the book, I completely lost the Christ allegory or any Christian theme in the book (outside the general themes about good vs evil). So maybe the movie failed to do the novel justice, or maybe I am unaware of the way many Christians see their faith (I am an Orhotod Christian but I was raised in an atheist family and basically all I know, I’ve learned with the help of my best friend… We discovered the faith together, though I must admit she knows more about it). My grandmother was Catholic (well, she was raised in a Catholic family), but she wasn’t religious at all. This is true, and it’s one of the reasons I like his work a lot. I know different people see different things in LotR, which is their right (anybody can interpret a novel any way (s)he wants), so some people think the whole novel is a huge WW analogy, which he denied with passion. I’ve always believed he simply wrote a story, creating these artificial myths that are so real, so rich in details, so full of languages (that can actually be spoken, with real grammar and all), that they seem like a real mythology created by a group of people. That is a very important thing that all (to my knowledge) other high fantasy novels lack: to create a believable world, it’s not enough to have a rich imagination, you all need to have a knowledge of how to make it work, how to make it real. (That’s why I think anthropologists would make good fantasy novelists). Ok, I’m getting a bit off topic here, but Tolkien’s thread is empty. He deserves some love. Maybe I should post my thoughts there? Please, join me. There are lots of Christ references vis a vis Aslan but the most obvious in the first book/movie is when Aslan lays down his life for the traitor Edmund in order to save him (save his soul) from the White Witch. Aslan gives himself over to evil incarnate and is literally sacrificed (ritually murdered) but unbeknownst to the White Witch there is Deeper Magic created by the Emperor Over The Sea (Aslan’s father) which supersedes the normal rules and thus causes his resurrection. In The Last Battle Aslan even more literally takes on a Jesus role as those creatures who fear and hate him go to hell -on his left side while those who love and trust him do not. Tolkien wrote that the LOTR was a fundamentally religious and Catholic work. It’s not as easy to see as the paint by numbers style of Narnia but it’s there-more subtle but there. Yup. Aslan definitely falls in that category and if that’s how you understand that character/symbol more power to you. For myself I just think it important to keep in mind that Lewis was being extremely particular (and to Tolkien’s mind far too obvious and ham handed) in linking Aslan to Christ and the entire Narnia story to Christianity. That was his understanding and intent as he was a devout Christian. I know each reader interprets things for himself. Although the allegory is just as strong in some places as the Narnia books the Perelanda Trilogy by Lewis is written for adults and is probably better written though his essential conservatism shines through a little more and may occasionally off putting to modern sensibilities. @shady: Yes, I see the christian point of view too, but for me, because of my own thoughts about these things, I see the religious themes in more over all mythical level. Saviour character, good vs. evil etc. are not christian themes, they are universal ones in my mind. And if we look Jesus character in LotR, would it be Frodo, humble hobbit who still can endure the hell and saves the world by going to his doom voluntarily or who else could it be? The themes are there but even if the writers saw these works as christian, the themes are something bigger than just a representation of that faith. Granted, in Lewis work it is much more clearer and up front, but still. From the race point of view, it is interesting that the main villain in Lewis work is the White Witch and that Aslan is lion, a creature from Africa. Hmm. As I mentioned you can’t really tell someone how to interpret or enjoy a piece of art/literature. Each person enjoys it in his or her own fashion. But Christianity does have some pretty distinctive traits and ideas which other traditions lack-and vice versa. So although there are some “universal” characteristics in the Chronicles of Narnia those are (IMO) much muted in favor of a particularly Christian idea of sin, suffering, fall, evil and repentance. Some religions don’t even have the idea of sin and evil, after all. Tolkien was far a better writer than Lewis and there is no real singular Jesus stand-in in LOTR but many of the characters have those sorts of traits-whether it be Gandalf who falls in battle with evil and is literally reborn from the dead, Aragorn who knows early on that he is the redeemer and has the ability to heal the sick and command the dead but hides for years from those who would have happily killed him as a child, Boromir who lays down his life in repentance for his sin, Frodo and Sam, who suffer both physical and mental torment and temptation by carrying the ring, and Frodo again who forgives those (Saruman) who would do him harm. Certainly some of those things can be found in other traditions but Lewis in particular and Tolkien as well were working from a Christian/Northern European framework. It’s been a while since I’ve read Lewis’s work but I seem to remember the Calormenes as being described as one would describe Turks/Arabs with a lot of negative characterizations. The only “good” Calormenes are either part Narnian anyway or convert. I could be wrong about that…Like I said I didn’t find Lewis anywhere near as problematic as some other fantasy/sci-fi authors. Shouldn’t that be the other way around? “The Lion, the Witch and the Wardrobe” is the first book in the series, after all. “The Magician’s Nephew” was written and published after “The Lion, The Witch and the Wardrobe” but the events depicted therein happen earlier than the first book. Sorta like the Silmarillion and the LOTR. I never thought about C.S. Lewis essentially having a cameo in his own books. That’s an interesting point. At least as a kid, I much preferred Lewis to Tolkien – but I think Lewis was writing Narnia for children and Tolkien wrote LOTR for adults, so to me it is almost strange to compare them. They wrote for different purposes and different audiences. As a child, I certainly found Lewis a lot more accessible. I saw The Lion, The Witch and The Wardrobe a PBS series and read Lord of the Rings and The Hobbit as a young adult. I never related any of the plot or characters to Christianity and I had been raised as a Christian. Only years later did I hear the Chronicles of Narnia was suppose to be an allegory for Christianity. Perhaps i thought of the bible as an allegory for the struggles of humanity and humans relationship to God. I wasn’t raised in a literalist tradition. @ hator: same here. It just did not even cross my mind while reading those, particulary the LotR. I just saw it as a story about the good and evil and the choises we all must take. There are many people I know who despise Narnia because of its strong Christian theme. But, Abagond, I think you should do a write up on His Dark Materials (the Golden Compass series), which is written in opposition to Narnia. I am not sure if you’ve read the books. They’re dark and anti-religious. You also suggested that the Narnia books help to explain this world, and I would encourage you to explain what you mean. I’ll be interesting to hear. PS. Sadly, it looks like Voyage of the Dawn Treader will be the last movie in the franchise. It isn’t doing so well at the box office, and after what happened with Prince Caspian, the franchise is in serious jeopardy of being dropped…again, for good this time. Someone complaining about the “whiteness” of the books/movies. Keep in mind that these books are dated. The story takes place in World War II England. The children in the books are all related. -for Jor-El so loved the world he gave his begotten son…. I find it odd that you are so adamently fond of the white folks’ religion, Abagond. But Christianity had long ago spread to North Africa, [Coptic Christians] before it was ever adopted in Europe. It’s tempting to see everything in terms of Black and White, but not accurate. @king: correct. Actually christianity was just one of the jewish sects in the beginning with James the Just as the head of the original chirch in Jerusalem. After the destruction of Jerusalem by the romans the only ones who remained were the hellenistic jews who the adapted the elements of old greek mythology into the jewish christianity. And yes, the coptic church is much older than any of the others, roman, eastern, not to mention all the northern versions of it. When the copts were building churches in Alexandria, we were very much pagans. Present day Germans were not christians untill 800’s. The danes after that, the swedes 1000’s and some finns 1100’s. The carelians were pagans untill 1300’s. Lithuanians converted with their king Mindaugas 1380’s and only after the pope gave him the whole Poland. So we can really argue that christianity is and never was a “white religion” in any sense. Just like we can not argue that islam is somehow a black religion. Saw the movie last weekend. Sucked BIGTIME. True, but Christianity was spread to black Americans by their white slavemasters. Although no one back then really used descriptive language like “white” in the way we would today I would argue that through a variety of historical accidents Christianity did become associated with Europeans much earlier than AD 800. Romans and Spaniards and Greeks were “white” of course and by the later part of the Roman Empire were mostly Christian. Of course the Goths also became Christian and this would include people like Alaric, Stillcho and Clovis. So it’s correct to say that Christianity wasn’t adopted by Scandinavians until much later I think one could make a reasonable statement that it was quite closely associated with Europeans as early as AD 500 or so. I think the genesis of Christianity’s success in Europe can really be traced back to Constantine. Gibbons famously blamed Christianity for in part hastening the fall of the Roman Empire. @shady; true, but I was talking about the ture White part of Europe, the North. Up here in the northern parts of Europe christianity was not that hot for centuries after Constantine, who, by the way, also remained as pontifes maximus (pagan high priest of Rome) all his life and who, according the christian propaganda, converted only in his death bed. Also, franks also took the cross, sort of speaking, in those days. As for the vandals, they were of course the wrong christianity, as were the goths originally. They were arian, which was the reason Augustinus so lamented the sack of Rome by the vandals (which again was not in reality much of sacking outside the christian propaganda). However, we can say that mediterannean areas were christian in a sense by 500 and northern central europe by 1000 and the rest by 1400. The coptic church and some other african sects (destroyed by the catholics later on) had been around some hundred years by then. So christianity was not simply a white religion per sé. Of course this is as much of a political statement as a biological one. But Franks, Gauls and Goths were not really Mediterranean peoples in any sense of the word and they were among the people who were most active in bringing Christianity (ironically via conquest) to Northern and Central Europe. I would mostly agree with your time line but would quibble somewhat with the dates. We didn’t talk about the Orthodox who were also instrumental in spreading the gospel in Eastern Europe. But digressions aside I still think it’s safe to say that although Christianity was not in its beginnings a native European faith, for a variety of reasons Christianity became very closely associated with European nations/cultures while failing to make as much of an impact (until recently) in Africa and to a lesser extent West Asia. So by 1400 or so except for a few outliers, (Ethiopia, Copts) and other minority groups in West Asia, North Africa, “Christendom” was virtually synonymous with “Europe”. So to large portions of Africa, East and South Asia, the Americas, Australia, etc Christanity was introduced and initially understood to be the “white’s religion”. So both things can be true-Christianity can have non-European origins and centuries later be considered by all to be a defining element of European culture…just as what’s happened with blues or rock-n-roll over the past 50-60 years. So I don’t think we have any real disagreement. @shady: true, it safe to say that by 1200 Europe was christian excluding the most remote areas. So it can be said that in this vein it became a christian continent and the christianity that we know today is this version of it, not the original semitic and eastern one, nor the true first church of James the Brother of Jesus. I am also adamantly fond of white folks’ science and white folks’ medicine. White folks are not 100% evil and deluded. Christianity, like Buddhism and Islam, is a universal religion. Like Western science it belongs to all of mankind. Sure, some white people have twisted Christianity to their own ends as a weapon against blacks. But they have done the same with science. Should I not believe in science too? Very interesting. I loved the books as a child. I then went through a period in which I was pissed off, because I thought my beloved childhood books were religious propoganda. I’ve gotten over that for a while, though. In my opinion, religions are stories and social structures. So now I once again appreciate the lovely word of Narnia and how it held me as a child. I love all well-told stories.